For those truly interested in growing and moving toward the ideal, the Spitzer Center for Visionary Leadership comes in to diagnostically help determine current state of individuals and/or team and more importantly offers practical strategies to move toward the your ideal end desired goal. We offer several types of practical and useful diagnostic tools. 1. The Organizational Culture Inventory® (OCI®) measures the current culture of an organization in terms of the behavioral norms and expectations that are rooted in shared values and beliefs. 2. The Organizational Effectiveness Inventory® (OEI) measures the structural and procedural factors that influence and shape their cultures as well as the impact of that culture on members. This understanding can then be used as “levers” for positive change throughout the organization. 3. The Organizational Culture Inventory® Ideal (OCI® Ideal) measures the extent to which behaviors should ideally be expected of people, in order to maximize effectiveness. Effectiveness can be viewed in terms of the involvement, motivation and productivity of employees, as well as the overall long-term performance of the organization. 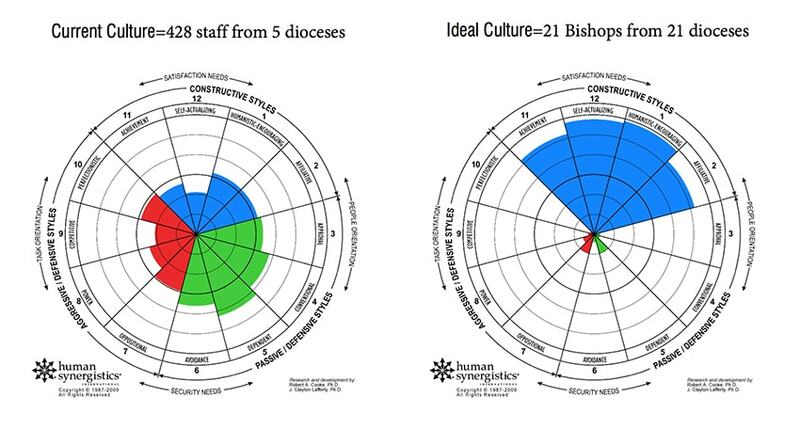 As an example, below shows a staff’s actual chancery culture versus the bishop’s ideal chancery culture. Overall, the largest gaps between the Current and Ideal profiles are in the Passive/Defensive (green) cluster. Of course, we debrief the dioceses, but more importantly, we work with the bishop’s on areas they would like to see decreased and subsequently increased in the Constructive (blue) styles amoug their staffs. Overall, these kinds of engagements are highly successful and the feedback from just about everyone is very positive. Often, with comments, on how they wished they had know about the win-win of this kind of Organizational Culture Inventory. Both the current and ideal OCI measure twelve distinct styles that describe an organization’s culture in terms of the ways in which members are expected to approach tasks and interact with one another. Individual responses to the OCI are aggregated to the organizational level and are plotted on a common scale. This allows you to see the gaps between the desired ideal culture and the perceived current culture. Action plans for improvement can then be very focused. The CFA measures 22 character strengths and harmonizes with our traditional virtues. Ultimately this contributes to greater self-knowledge thus enabling personal growth in happiness and purpose. This survey was developed by the Peirce Group, whose expertise is survey creation and validation. This 360 assessment is designed for executive leaders. It measures one’s desired leadership style compared to one’s actual impact, with practical strategies to move toward the ideal. The 12 styles measured match the culture survey for ready alignment. The Leadership/Impact is administered online and scored by Human Synergistics, an independent company specializing in training and development materials. The Leadership/Impact is designed to provide bishops, vicars general, and the bishop’s cabinet in general, with otherwise unavailable feedback on their impact on others as well as the strategies and techniques that account for this impact. The goal is to gain greater self-knowledge and understanding of what kind of leader you want to be, and provides you with a toolbox to help you achieve that end. Similar to the Leadership Impact, this survey is designed for those who are responsible for management activities. This survey focuses on how managers carry out their responsibilities and the impact this has on the behavior of the people around them. Most managers are unaware of how their behavior is perceived and interpreted by others. The feedback from this survey provides a manager with an understanding of their current performance and the steps to take to enhance effectiveness. The Spitzer Center developed the Presbyterate Culture Survey in collaboration with a diocesan council of priests and the Peirce Group, whose expertise is survey creation and validation. The behaviors that the priests recommended were supplemented by behaviors cited in the Decree on the Ministry and Life of Priests (Presbyterorum Ordinis) from the Vatican II Council. The Presbyterate Culture Survey measures the current culture as well as capturing a vision for the ideal behaviors that most inspire priests. As a result, we provide an onsite debrief with priests in which we identify specific gaps, brainstorm ways in which to fill the gaps, and ultimately develop a collective action plan. Make every effort to supplement your faith with virtue, and virtue with knowledge, and knowledge with self-control, and self-control with steadfastness, and steadfastness with godliness, and godliness with brotherly affection, and brotherly affection with love.